When the TV news was especially grim, or the computer broke down, or any of the other small frustrations of daily life began to get me down, I would go for a walk in the woods with my dog. 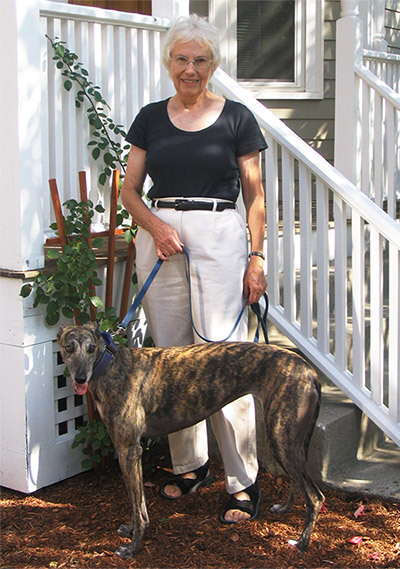 She was an adopted racing greyhound, one of those discarded by the track when she stopped winning money. She was incredibly beautiful, as delicate and graceful as a fawn. The walk was the highlight of her day. She poked her nose into every bush and pile of leaves, checking for messages other dogs and wild creatures had left behind. This was her time to be all dog, to connect with everything that had happened in that place since she last passed through. I would wait until she had quite finished her research. It lifted my spirits to be able to give her the natural life of a dog, a life she never experienced until she was four years old. Greyhound racing is an anachronism left over from the 1920’s and 30’s. Humane standards have evolved during those eight or nine decades, especially in recent years. But greyhound racing continues, backed by powerful gambling interests and hidden from public view by an entrenched culture of secrecy and lies. Some greyhound owners and trainers think of greyhounds as business property, like office furniture. For over seventy years, state laws have supported them in this view, allowing the racing industry to treat dogs as objects. A greyhound track requires a population of about 1,000 dogs to function. Space is money, so greyhounds are kept in warehouse conditions, confined in stacked tiers of small cages. They spend twenty hours or more a day in the cages, lying on shredded newspaper. A few times a day they are turned out in groups to relieve themselves. Occasionally they are given a practice run. Each dog races a few times a month. Otherwise it’s life in the cage, for months or years on end, until they become too old to race or can no longer earn their keep, whichever comes first. The standard cage size, usual throughout the industry, is 32 inches wide, 42 inches deep and 34 inches high. 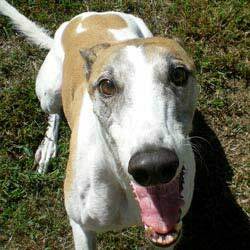 A large greyhound, standing 30 inches at the shoulder, cannot fully raise his head if he stands in his cage. The risk of injury is high. Racing in a pack around tight turns at speeds of forty mph or more, greyhounds collide, fall, and break their fragile legs. Before racing was ended by the voters in my home state of Massachusetts, tracks were required by law to report greyhound injuries and deaths. More than eight hundred injuries were reported at the state’s two tracks from 2002-2008. Over eighty percent were fractures. Other injuries included broken necks, crushed skulls, seizures, paralysis, and cardiac arrest. Hope survived; she was one of the lucky ones. 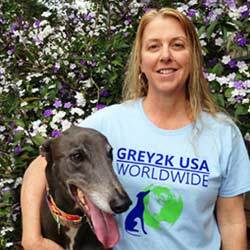 Although we have made great progress since GREY2K USA was founded in 2001, greyhound racing continues to maim and kill dogs. At two West Virginia tracks, 7,747 injuries were reported from January 2008 through June 2017. Three hundred and eighty-eight dogs died. Worse yet, the latest racetrack records from Florida show that a dog dies every three days. Greyhounds have been electrocuted when they were thrown onto the live rail that powers the lure. This is cruelty on an industrial scale, embedded in a system that was ignored by the larger society for decades: a system that says it’s fine to keep dogs in cages and force them to run around in circles and risk injury and death so that people can bet on them. Greyhounds are not office furniture. They are not things to be used and thrown away. They are sensitive, gentle dogs, no different from other dogs who are loved and protected by millions of American families. When the facts of greyhound racing are brought to light, public opposition can force a change. 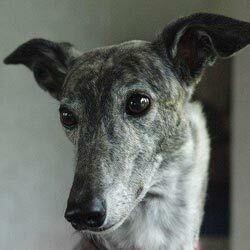 My greyhound’s name was Hope. I did not give her that name; she came with it. In my more fanciful moments I take that for a sign. Meanwhile, in the real world, I work to bring about the day when no American greyhound will be forced to run for the money. Your support of GREY2K USA will help realize this wonderful goal.